The dulcimer in the photograph was glued together a few years ago. I know this because the quality of the photograph is better than possible with the camera I am currently using. I also know this because the dulcimer in the photograph is currently being regularly played by its owner. I just happened to have this photograph on hand. 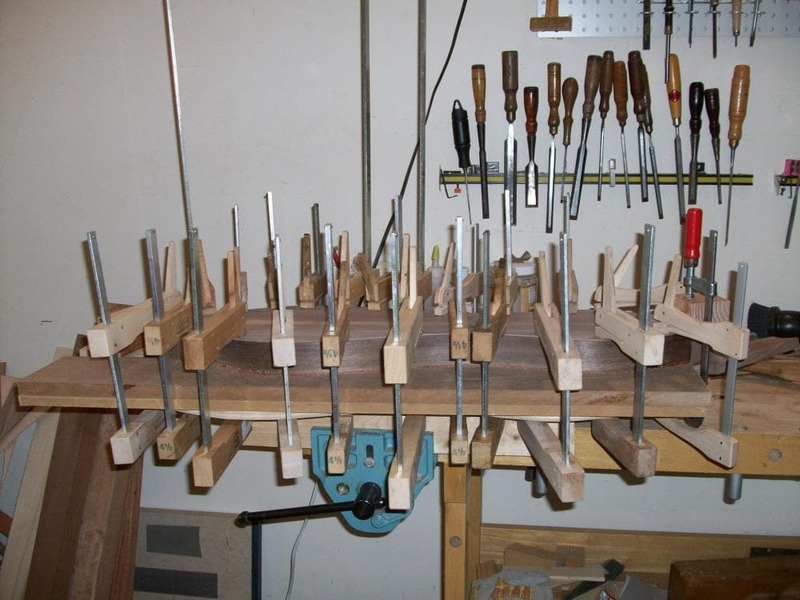 Gluing a dulcimer body together is basically gluing the lid on a box. If I decide I need to open the box it means opening up glue joints. This is certainly possible and something I do when required to perform a major repair. Taking a dulcimer apart after gluing the box closed is never something I look forward to. Just before gluing everything together I usually have a few pieces of wood outside and inside the dulcimer holding everything in place. Moments before gluing things together I take the pieces of wood out of the inside of the dulcimer. After a short panic-filled searching of the bench I saw that indeed I had.